Houghton Mifflin Harcourt, 9781328546395, 272pp. DR. KAI-FU LEE is the chairman and CEO of Sinovation Ventures, a leading technology-savvy investment firm focusing on developing the next generation of Chinese high-tech companies. Before founding Sinovation in 2009, Lee was the President of Google China. Previously he held executive positions at Microsoft, SGI, and Apple. Dr. Lee received his Bachelor’s degree in Computer Science from Columbia University, his Ph.D. from Carnegie Mellon University, and honorary doctorate degrees from the City University of Hong Kong and Carnegie Mellon. He is a Fellow of the Institute of Electrical and Electronics Engineers (IEEE). Selected as one of the 100 most influential people in the world by Time Magazine in 2013, he has authored ten U.S. patents and over a hundred journal and conference papers. He has written eight top-selling books in Chinese, and has more than 50 million followers on social media. A New York Times, Wall Street Journal, and USA Today Bestseller! Featured in the New York Times, the Wall Street Journal, the Washington Post, Wired, Financial Times, Bloomberg Businessweek, Business Insider, Forbes, and more. “Kai-Fu Lee is at the forefront of the coming AI revolution, helping us transcend the limitations of thought, reach, and vision. This seminal book on AI is a must read for anyone serious about understanding the future of our species.” —Peter Diamandis, Executive Founder, Singularity University; bestselling author of Abundance and BOLD. 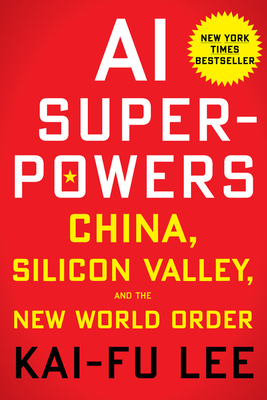 “In this riveting page-turner, one of the founding fathers of China’s AI industry tells the inside story of China’a rise as an AI superpower, and shares his inspiring recipe for us flourishing rather than floundering with AI.” —Prof. Max Tegmark, professor, MIT and bestselling author of Life 3.0: Being Human in the age of AI. “Kai-Fu Lee's experience as an AI pioneer, top investor, and cancer survivor has led to this brilliant book about global technology. AI Superpowers gives us a guide to a future that celebrates all the benefits that AI will bring, while cultivating what is unique about our humanity. It’s one of those books you read and think, ‘Why are people reading any other book right now when this is so clearly the one they need to be reading?’” —Arianna Huffington, founder, HuffPost, and founder & CEO, Thrive Global. “Kai-Fu Lee has been part of the AI revolution for decades. Now, in this fascinating and galvanizing book, he puts into perspective China’s role in the emergence of AI superpowers onto the global scene. He also gives us an optimistic view of a future where, working together with AI systems, people can augment and amplify many aspects of work and life.” —Daniela Rus, professor and director, MIT Computer Science and Artificial Intelligence Laboratory. “Kai-Fu Lee's analysis of the perils and promises of AI is clear, convincing, technically sophisticated, deeply personal, and humane. Reading this book has given me a new way to think about the technological future of China, the United States, and the world.” —James Fallows, The Atlantic, author of China Airborne and Our Towns. “The book offers a wise guide to how we, as individuals, should set our priorities each day, each month, and each year. And it offers an equally wise, global perspective on how society might build a future that harmonizes AI’s power to think with humanity’s distinctive capacities for love, service, and compassion.” —Jeffrey Lehman, vice chancellor, NYU-Shanghai, former president, Cornell University. “Kai-Fu Lee has written an essential book for our times. His lively, readable and personal perspective on China’s transformative achievements in technology and innovation is especially important—required reading for every policy maker, technologist, and business leader in the West.” —Marcus Brauchli, former executive editor, The Washington Post, and managing editor, The Wall Street Journal.